Only Roger Ebert could put this sentence into a review and still sound eloquent as hell. Just a few days after announcing a leave of absence to deal with his ongoing battle with cancer, Roger Ebert died today at the age of 70. Often, Ebert’s reviews were more entertaining than the films themselves. He could describe a scene from a good film in a way that totally made me rethink how I watched movies. He could deconstruct a bad film to such an accurate degree that it would eventually be hard not to burst out laughing. He knew when to be incredibly serious and when to insert his beautifully crafted wit. Ebert also reinvented what it meant to be a film critic. He was the first film critic to win a Pulitzer Prize for Criticism for good reason. In the Rotten Tomatoes era, certain critics (I’m looking at you, Peter Travers) are just looking to get write the best quote that will get put up in the next advertisement. Ebert didn’t write superlative reviews. Sure, his reviews instructed you on whether or not to see a movie. However, his reviews were also just as, if not more, helpful to read after viewing said movie. A Roger Ebert review was more than just an expression of liking or disliking something. Ebert put a little piece of himself into every review he wrote. Even if it wasn’t explicit, you could tell from a review exactly what his viewing experience was like. Ebert was one of the few critics who seemed to understand what a subjective experience watching a film was. And even when he attached stars and thumbs, he acknowledged that they were not absolute. Ebert showed that the critic could be just as important of an artist as the filmmaker was. After he lost his voice, he lost his show. However, that didn’t stop him from writing. In fact, it made him better and even more prolific. 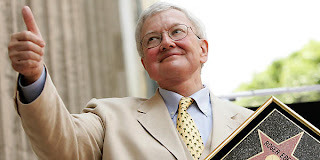 During his long battle with cancer, Ebert branched out and wrote political essays, a biography of Martin Scorsese, and a memoir. Yet, the reviews will always be the greatest part of his repertoire. Roger Ebert taught me both that good criticism breaks away from the usual review structure. Most importantly, he taught me that having an opinion was about more than using the words “love” and “hate,” and that having an opinion could be turned into a funny, eloquent, and masterful piece of art. This entry was posted in Roger Ebert on April 5, 2013 by ian0592.